Are you considering planning or executing a program? Spot problems early, fix them, and accelerate smoothly away. The more the executive team shares a common view of the change, the greater the chance of success. Disagreements in the C-Suite is the major cause of program failure. All executives must have shared accountability for the program, and commit their organisations to deliver the change. Most companies aiming to run 5–6 business-critical programs are probably only capable of delivering 1–2. Maintain speed and focus by directing more energy into fewer programs. Make sure you’re not trying to execute too many at once. Your strategy needs to be realistic. Schedules will change, obstacles and new challenges will appear. The strategy needs to describe the work in detail, dependencies, key assumptions, resource levels, financial considerations – and the expected business results. A business-critical program needs its own organisation to inject pace. That means a tailor-made team, a custom organisational model – and a dedicated, standalone plan. If you’re involved in a major program, make sure you’re not being asked to organise it around your normal work. This needs to be an experienced, capable, seasoned professional. Directing a program is a full-time job, not to be shared with another role. If they’re a coordinator instead of an executive calling the shots, alarm bells should be ringing. Nothing slows business-critical programs more than trying to run them with fragments of people’s time. Functional Directors in every business should play a pivotal role in “nourishing” your business-critical program. They’re an indispensable part of your extended program team – make sure they’re involved at the start. Check your performance management system is robust, clear, and will answer the following questions: what’s happened, why, is it going to continue – and what are we going to do about it? Facing facts is an essential part of successful program execution. It also provides key information on how to run things faster. Evaluate your supplier relationships – they can make or break your program. How strong are they? Can they support your program strategy? Develop a ‘partner to win’ approach with suppliers to make sure programs run as fast as possible. Assess the nature of your risks at the start, using the following criteria: what’s the level of understanding of current risks? How likely are they to appear? What can be done to mitigate risks? This process also gives your team confidence they can prevent, minimise, or work around risks. Complex programs require a disciplined approach from the outset otherwise achieving desired outcomes could be at risk. When planning or executing a program, identifying problems and nipping them in the bud early will increase your chances of success. 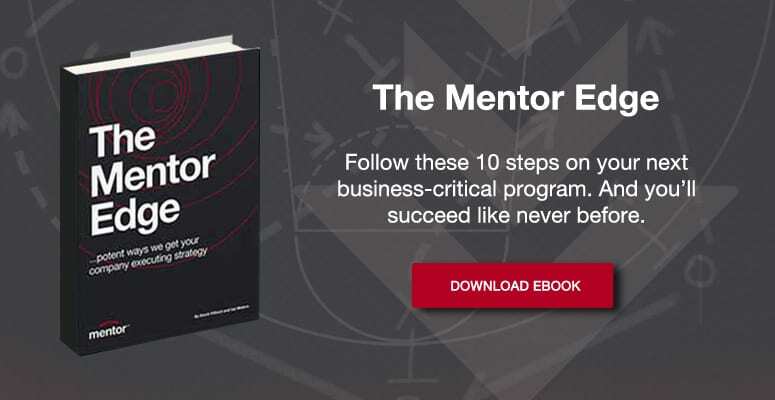 By following this ten point framework, Mentor has helped many companies achieve program success. Want to see how this guide leads to success? Check out what our clients have to say in their testimonials. The first step in making program strategy concrete is to explain the facts, without spin. Make sure everyone fully understands what you’re asking of them. Plain talk is the only way to invigorate your team, encourage them to make sacrifices, and foster an innovative spirit.